In 2011, founder Rebecca Prince-Ruiz, began the Plastic Free July campaign in Western Australia to explore the issue of plastics pollutions in the oceans through a Churchill research fellowship. The purpose was to explore the impact of plastic use on the oceans. Plastic Free July campaign focuses on bringing more awareness to the single usage of plastic and to refuse single plastic use on a regular basis. Today, Plastic FREE July campaign has a tremendous 1 million participants in Australia and globally with an even bigger audience anticipation in 2017. Schools, organizations, and individuals can participate with their Plastic FREE July registration. 1) Go register here and it’s free. They even have a tool box to help you out. 2) Follow Beth Terry’s My Plastic Free Life Blog for inspiration: 100 WAYS to live a plastic free life. She's is speaker and blogger on this topic. 3) Travel Light as much as possible and cloth linens for packing, bags, etc. 4) Read Zero Waste Home and go to Bea Johnson’s page where she gives tips on a zero waste home which is an excellent resource on zero waste home. 5) Follow Kathleen Zero Waste Wanderess, blogger living with less trash/plastic for a travel perspective. 6) Three must haves when traveling: 16 oz. mason jar, napkins for take-out or snacks, and 2-3 size cloth bags. These bags can be purchased or you can make them if you are in a crafty mood from clothes not being used or old linens. That’s it. Keep it simple as you travel. Plastic free shouldn’t be a burden but a new way of thinking about your impact on the world and the oceans. I hope you try these 6 simple steps in your home and while traveling and comment below to tell me how your journey began and any stories that come out of your zero waste travels. Feel free to sign up to my e-newsletter for more sustainable travel tips and behind the scenes development of my sustainable travel handbag collection. I will be featuring more insider tips on traveling light. Plus, I will feature how the first product will develop with local experts in the city where I live, San Diego. See how I talk to different players in the sustainable fashion fields as I take the necessary steps to launch my travel handbag business. Customer feedback, giveaways, and feature stories on your travel journeys will be highlighted in the newsletter so don’t miss out and sign up for your dose of sustainable travel handbags and sustainable lifestyle. SIGN UP and Don't MISS out on giveaways! Today we will begin with 7 ways to help you get started with sustainable fashion. As I share my journey in the sustainable fashion world I have been asked how can I get started with my sustainable fashion from many different people from curious family and friends to designers and professionals. It's a question that keeps getting asked over and over as I prepare to launch my travel handbag collection. To be honest with you, this is the part I like the most because it really ignites the questions of where do my clothes come from and who really makes them? These are simple questions with diverse answers but I will try to give you easy way to get started with sustainable fashion. Did you know that the apparel industry is the number two polluter in the world? It's right next to the oil industry which is number one. Yikes! According to Eileen Fisher, one of the most well known clothing designers spearheading her initiatives on sustainable fashion and winning accolades for her environmental apparel collections, states, "the fashion industry is a mess" (EcoWatch August 2015). And this is coming from a designer making amazing strides in the apparel industry. We have a lot of work to be done and all of us must participate. I invite you to start with this first step. So what are the necessary steps you need to take to revise your wardrobe? Here are 5 mini-steps you can integrate when you revise your wardrobe. I say mini steps because it can get overwhelming for anyone especially people in the U.S. because more than often we have a lot of stuff. I consider myself a minimalist from early on in college but I still feel like I had a lot to revise when I wanted to tidy up my wardrobe. Take each mini-step as part of your process and then move on as you see fit. There is no right or wrong way to do this just as long as you feel like you are revising your wardrobe and looking at your pieces you want to maintain or giveaway. Look at the clothes that are your go to clothing (make the top 3-5 pieces). Consider your top 5 bottom (pants or skirts). Consider your top 5-10 tops ( sweaters/blouses/t-shirts). Revise your top 4 accessories ( hats/purses). Look at clothes that don't fit you. That's usually how I revise or downsize my wardrobe and I'd like to make it lean as much as possible. I really like seeing all of my clothes in one place and I find it very relaxing that it's kept to a minimum. Do I have a couple of items that I wore that don't fit me? Yes. But I keep those to a minimum. So the next question is: What do I do with clothes I don't want anymore? Good question. That brings me to the second way to get started with your sustainable fashion journey. One quick way to do this is to make a list of three textile recycling locations. The key to locating these places is to make sure they are recycling the majority of your textiles. While the Salvation Army or other resale clothing entities have served as major locations to take your used clothing for resale, the majority of clothes are sold to for profit organizations which are sold abroad. And it may seem like a win/win for all, it's important to consider your local community. 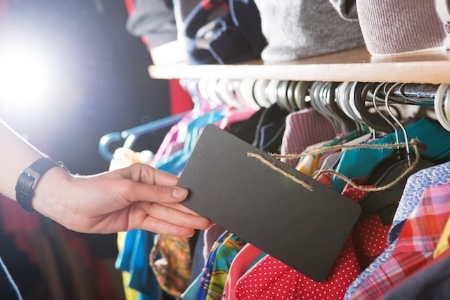 Look for recycling organizations that take your used clothing and benefit the local community. As a business owner, that's always on my mind and the reason why I am a business owner. The salvation army remains a much better option than a landfill. The best option would be to buy more from resale shops which include an array of many in your local area from designer local shops to larger stores with a variety to choose from such as Goodwill. In an Atlantic Monthly article, author and journalist, Elizabeth Cline states, only about 10-20% of clothing given to a charitable donation actually get sold in thrift stores. Then, the other 90% on average are sold by charitable organizations (Source: Secondary Materials and Recycled Textiles). So finding a variety of textile recyclers are important because you want to know if it will be going back to your local community. One company that gives back to the local communities is American Textile Recycling Service. Also, refashionNYC is making strides in New York on a local level while preventing textiles to reach a landfills. Nothing is perfect but it's important to consider how you clothes can be recycled and reused as much as possible. Influencers provide a wonderful starting point for a brand or a company. The influencers' job may include introducing the essential brand information to the public. They can serve as a dynamic role in brand awareness for a company. This information phase today is important more than ever in the sustainable fashion world. The following sustainable fashion influencers are creating change with their voice and platform and really resonating with audiences each with their own story and style. Here are some influencers that inspired me. I love learning from them as I continue to develop and prepare my travel handbag business. Alden Wicker at EcoCult : Wicker has a fantastic and savvy blog on sustainable fashion in NYC covering food, beauty, home/decor, wedding, travel and so much more. Her refreshing voice on conscious style and apparel reaches many fans because of her authentic, informative and unique voice. Her expertise on the pulse of sustainable fashion is remarkable. Jennifer Nini at Eco Warrior Princess : Nini, based in Australia contributes a wealth of knowledge on beauty/health accessories, musings, green home, transparency reports, fantastic videos and fascinating guest post to capture her journey since 2010. Natalie Kay Smith at Sustainably Chic has a captivating, fun and thoughtful blog. Smith is a social entrepreneur providing clarity and promoting sustainable fashion brands with important message and story in order to reach audiences who are looking to understand the new brands entering the market around the world. Katie Roberts with Sustainability in Style: Roberts draws many readers in with her message of changing the world one wardrobe at a time. With a masters in environment and majoring in sustainable education, she informs her readers like she is your own friend with reliable facts and solid perspective. There are so many to add to this list and writing about the amazing sustainable fashion influencers in such short sentence or two does not do it justice. Promise me you will check them out. Ask questions and more than anything and follow their story. Everyone has a story and that's the best part of these influencers. There is a story behind each human being. The story continues with you too. You won't regret it. But who else has a story? This could be another blog post but I had to include this short version of it. I am a lover of information especially all things sustainable fashion and entrepreneurship but if I were going to recommend amazing podcasts it would the following three (and in no particular order because they are all fantastic). The American Fashion podcast: This podcast is moderated by Charles Beckwith, Cathy Schepis, Seth Freiderman and Lisa Maria Radano, This podcast gives you an in depth look into the American fashion landscape with episodes including fashions designers challenging the current fast fashion industry to episodes on apparel manufacturing in the U.S and everything in between. Episodes include the players who not only question the current fashion industry standards but are actually really doing something about it every step of the way. I really enjoyed episode 121 because it simply inspiring and reassures me that we are moving toward progress. It's a podcast I actually go back to again and listen to previous episodes because it's that good. Trust me, go subscribe and see for yourself. Spirit of 608: Founder, Lorraine Sanders, a seasoned fashion journalist covers how fashion, entrepreneurship, sustainability and tech intersect and refers to this as FEST on her podcast. She interviews business women in the FEST spheres. I am beyond inspired when I listen to her interview because she really approaches each interview with in depth understanding and pulse of what it means to navigate the fashion industry in these times. I especially like how she is opening up her podcasts to up and coming new designers. Her main focus is on women leaders in the FEST industries. Also, Sanders has launched her PRESSDOPE PR campaign and it looks epic. Check Sanders and her team out. Need I say more? Conscious Chatter: Founder of AWEAR world, Kestral Jenkins, created a unique platform to provide a community of change makers to consider where clothes were made, what they are made of and who actually made them. Jenkins, a journalist, brings great clarity to less talked about complexities of the fashion industry on her podcast, Conscious Chatter. It was actually my first podcast I downloaded when I began researching more in the past year. All of her guests are doing amazing initiatives. When things get overwhelming as an entrepreneur, this is the podcast that makes all things clear. Just subscribe and you will see. Tell me what you think about them in the comments below. Let's keep going with technology as a tool. Without sounding preachy, please know before you buy because in the end, consumers have the power to buy with our wallets. I am referring to all brands. Let's face it. There are brands in the fast fashion world and we are all aware of them (or maybe you are not) and then there are other sustainable brands we may not know about but there is an app for that! So how could you know your brands quickly and easily? Here are some quick resources at your fingertips with no excuses to not use them. Decide with your wallet. Healthy Green Living Groups: Meet up & Facebook groups: Sustainable FASHION Workshop, (I actually started this group on 1/1/2016) is a group of community members and sustainable fashion experts that want to collaborate and learn about the sustainable fashion world. Sustainable Fashion Events: Magnifeco (NYC) , EcoFashion Week in Seattle/Vancouver. Sign up for your Sustainable Fashion Directories and Submit one of your faves: Sustainable Fashion Directory & Shop Ethica (and there are so many others). Did I ever tell you? There was a time in my life where I was able to launch an organic cotton t-shirt business? I had the opportunity to see first hand the pulse of the market on ethical and clothing in the Midwest. But guess what? The timing was off. The financial market crashed while I was about to launch it. I decided to do it anyway. Was it risky? Yes. Did I care? Yes and no because I was hungry for experience and I wanted to test my business skills. It was bootstrap endeavor that lasted two years while I worked full-time but it gave me the drive and edge I was searching for because in the end I wanted to learn and go beyond the learning curve. I wanted to execute my gains and keep going but in the end I had a detour and other life events. I moved and had another pivot. But I saw this as all a gain. I learned so much with that experience. It really ignited my passion of conscious styled clothing for me. I finally found what made me tick and I couldn't stop learning and researching and most importantly I couldn't stop working on my dream. Back then when someone came up to me with the idea of launching a clothing business the only way for me to truly do something like that was through ethical and sound practices for the people and for the planet. It was a learning experience that lead me to this point in my life. Here was my conclusion: All I want to do is to create a space for ethical and sustainable apparel/ accessories where the people, planet and business come together to make sound business sense. Today, it's also known as corporate social responsibility for bigger businesses. My point is this: never stop learning. I'm always learning and I enjoy questioning the process of today's fashion industry: the vast history, the big players, the technology, but most of all the humanity of it because without it we would not be here at this point. So here's my a reading list that is never-ending in my book. While it's important to engage ourselves in obtaining more information about how our clothes are made and who is making them it is equally important to understand that civic engagement is key as well. There are few ways you can engage as buyer with your funds as well as voice your concern to create a more sustainable fashion platform in your community. Fashion Revolution is a significant global campaign to dedicated to ask yourself #whomademyclothes in a effort to bring more awareness and understanding about the fashion industry and the people who make the clothes each day. Carry Somers and Orsola de Castro, founders of Fashion Revolution "believe in an industry that values people, the environment, creativity, and profit in equal measure." So find out, be curious, and do something as the Fashion Revolution campaign encourages today. It's the global fashion positive movement asking Who Made my Clothes? Review Transparency Reports (A Report Card for Brands on their Supply Chain) and so much more. What are you doing today? What's one thing you have been proud of today to contribute to a more sustainable fashion community? I believe in community which is why I am building a sustainable travel handbag company. Therefore, I created Sustainable Fashion Workshop, a facebook group that will inform people in my community and others who are interested in learning about sustainable fashion such as designers, photographers, authors, stylists, influencers, scientists, and so many other players in the fashion industry. I invite you to be a part of this group so we can create of community of informed people about sustainable fashion and its future. Thanks for signing up and know you are valued! I am excited to send you a couple of FREE email tips and all you have to do is wait for it. I will be sending you a FREE checklist on sustainable wardrobe so it's easy as 1, 2, 3. and I will invite you to a FREE facebook group so you can meet others who are interested in learning about sustainable fashion as well as check out behind the scenes on my journey building a sustainable handbag. Also, I am creating a supportive environment for designers, photographers, stylists that are passionate about sustainable fashion. Please make sure you are receiving this email in your inbox NOT your SPAM. If not, just move it with a tag in gmail so you see it in your main mailbox. Watch out for pre-launch discounts, giveaways, and amazing interviews to come. You have already qualified for 20% off the launch collection. Cheers! Thank you and welcome to Nomada Co.